Majority of the deaths in Bangladesh due to the rain-triggered landslides reportedly took place in a remote hill district close to the Indian border. Dhaka: A series of landslides triggered by heavy monsoon rains have killed at least 105 people, including several army officers, in Bangladesh with the majority of the deaths reported from a remote hill district close to the Indian border, officials said today. The worst affected Rangamati hill district alone has witnessed 76 deaths, including four military personnel, who were on duty to remove the rubble to clear a major highway. According to local media reports, the death toll has touched as high as 105 and could rise further as many people remain buried under tonnes of rubble. 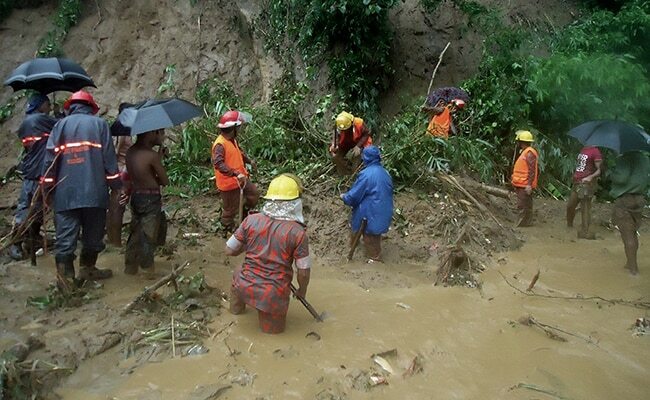 Landslides killed 23 people in Rangunia and Chandanaish upazilas of Chittagong, Dhaka Tribune reported. In Bandarban, six people were killed and five others injured in landslides, police officer Rafiq Ullah was quoted as saying by the daily. The reports said that over 100 people were injured, many of them critically, while searches were underway for more bodies even as many remote areas were difficult to reach due to inclement weather. "Most of the casualties were caused by landslides, but some died of electrocution, drowning and collapse of walls,"said an official at the southeastern port city of Chittagong. A military spokesman in Dhaka said an army major and a captain were among four of their dead personnel who were called out to remove landslide rubble from a highway linking port city of Chittagong with Rangamati. "A fresh landslide at the scene buried the detachment killing the four while one soldier is still missing . . . ten personnel were wounded in the (fresh) landslide," he said. Many of the victims belong to the ethnic minority or tribal groups in Rangamati and Bandarban who live in makeshift structures along the hills, officials said. The officials said many people were asleep when the landslides hit, causing more casualties, especially among children. "The rescue campaign is underway. We can get a clearer picture of the casualties later," a spokesman at the Disaster Management Ministry said, adding that the casualty figures could rise as many remain missing.